It’s that time of year when people are looking to get back in shape, and most of them start by running. It’s simple, it requires no equipment, and you can do it almost anywhere (unless you’ve been living in the upper Northeast). Running appears to be a logical way to burn fat and calories, and since anyone can do it, the assumed risk is very low. So you start by running or jogging a few miles every other day. However, let’s say you asked a personal trainer to design a program to restore your fitness. What if that trainer wrote out a workout and told you to do 3500 reps of each exercise? Yes, that’s 3500 reps. You’d consider him a fitness masochist, right? Such a workout would surely destroy your joints. Well, that’s exactly what running for 2 miles is: thousands of continuous reps of the same movement. It’s definitely not the best way to develop a body that’s in balance. This is similar to what Alwyn and Rachel Cosgrove have been saying for years, and I agree. If you’re a personal trainer who’s working with an avid runner, put him on a foam roller. Have him roll the inside, outside, and top of his thighs along with the outer hips. You’ll quickly see a look of excruciating pain on his face. Indeed, the repetitive nature of running throws the length-tension relationship of the legs and hips completely out of whack and this causes severe tension. The rectus femoris, IT band, TFL, adductors, psoas, and glute medius will be tighter than guitar strings. Plus, when you test the strength of the leg and hip muscles (especially the hip abductors) you’ll notice more imbalances than a Hollywood shrink sees in a month. One of the reasons why our hips are so imbalanced is because we spend so little time moving laterally or backwards. 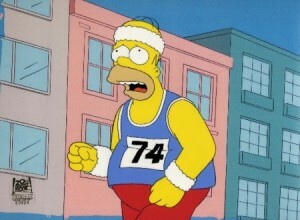 When you throw a long-distance, straight-ahead exercise like running on top of it, the situation only gets worse. That’s why, instead of traditional running, I have my clients perform an exercise I call the X drill. The beauty of the X drill is that it forces you to change directions so you never overload one repetitive hip movement. You’ll constantly alternate between moving forward, backward, side-to-side, and up and down. And when you perform it barefoot in the sand, it’s great for strengthening the ankles and calves, too. Make a square on the ground with four marker points all placed equally far apart (15 feet, for example). Start between the two back points, facing the two front points. Run forward until you’re between the two front points, then slide to the right front corner and squat down and touch the ground. Then slide to the back left corner (squat and touch), then slide to the right back corner (squat and touch), slide to the left front corner (squat and touch), then slide to the halfway point between the two front corners and run backwards to the starting position. That’s one rep. There are many ways to modify the X drill to suit anyone at any level of fitness. First, you don’t have to perform it in the sand without shoes. Second, the distance between the four corner points can be as short or as long as your space and client allow. Each time you return to the starting position is one rep. I like to have my clients do anywhere from 5-10 reps between sets of strength exercises, or combined with another conditioning drill. The X drill is also great to do with a weighted vest, or you can have them do a more complex movement at each corner. For example, instead of squatting down to touch the ground at each corner they could do a burpee or squat thrust with a jump. The options are endless. Speaking of metabolic training, Lou Schuler and Alwyn Cosgrove just released the third installment of their outstanding fitness series, The New Rules of Lifting for Abs. It contains a ton of excellent training and nutrition information to help you build a leaner, stronger body. Particularly, I like the options they outline for novel cardio exercises when space and equipment are limited. Interesting article. I never really thought about running in that fashion. Would you recommend swapping the sprints out of Body of Fire for the X Drill? CW: No, the BOF program has a progressive sprint plan in place that coincides with many other exercises that keep everything in balance. This is great one, Chad. Great! Common sense and expertise united. I have a question not exactly related to your post, but it’s still about “avoid running too much”: what do you think of training sleds? It obviously require more equipment (and I remember you said once that the better a trainer, the less equipment he needs), but it seems funny too! And you can push it or pull it in all directions to keep muscles in balance. CW: I assume you mean “fun” not “funny.” There’s nothing funny about pushing a heavy sled for 100 yards, but it’s definitely effective. I love the sled – one of the best training tools I’ve ever used. However, it’s not practical for many because of the space/surface it requires. However, if you have access to a sled you should make it an integral part of your fitness program. Wow, I never saw running that way. I used to run really often as I’m a middle distance runner, but I don’t run in straight distances any more – I only run when I play soccer. I also include some shuttle sprints in my training repertoire. Would you consider shuttle sprints and suicides as a form of running in a straight distance (forward and back)? CW: As long as you’re constantly changing directions, you’ll benefit significantly more than if you run in a straight line. Are similar problems caused by using a concept 2 rower for prolonged periods of time? CW: Yep, any machine that forces you to do the exact same motor pattern isn’t ideal. Plus, most people’s form goes to hell on that machine (ie, excessive, repetitive spinal flexion). Wow! Just did my first workout of X-drills. Just incredible. I know you already answered this Chad, but is there an alternative for the sprints in the BOF protocol. Finding a place to sprint is creating it’s own challenges..
CW: The key is to alternate between periods of high intensity and low intensity cardio. Sprints are simplest for most people. However, you could jump rope for, say, 30 seconds on at lightning speed and 30 seconds off. The X drill could work but I’d rather have people stick to BOF as designed. This was a good post and very insightful approach to negating common running injuries. I guess you could also go for a run, yet run forwards for some time, then backwards, then alternating sideways like shown in the x-drill above. It is easily adaptable as you mention. Great stuff Chad! CW: Yep, I often have my clients do exactly what you said. However, when space is limited, the X drill is an excellent alternative. Will X-drill be effective for this purpose? CW: For more endurance, do more rounds of the X drill and/or make the distance between each point further apart. Great drill! Thanks for sharing!